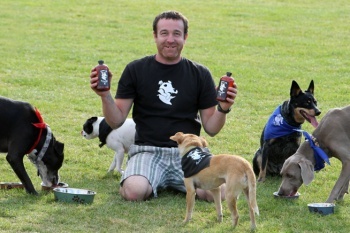 Dawg Grog lets canines share a love of beer with their owners. People from Oregon, I don't get you. Believe me, I've tried. I don't know whether it's your preponderance of used bookstores, or your unusually delicious ice cream, or your insistence that shorts and a t-shirt are perfectly acceptable attire for a fancy party, but I'm beginning to think that there's something fundamentally incompatible between the mindsets of New Yorkers and Oregonians. Case in point: If a New Yorker likes beer and dogs, he'll probably drink a beer while petting his dog. If an Oregonian likes beer and dogs, he'll invent a brew especially for consumption by pooches. Dawg Grog is a beer that only a dog could love, and one town in Oregon is using it as a marketing tool. The story began when Daniel Keeton, a brewer at Boneyard Beer in Bend, Oregon, wanted to share his passion with his loveable mutt, Lola Jane. Since alcohol can be harmful to dogs, Keeton devised a concoction of water, vegetable broth, spent grain from his brewery, and sugar (all organic, of course) that might not taste great to humans, but Lola lapped up. Thinking that other dogs might share Lola's love of beer, Keeton christened the product Dawg Grog and went about selling it in conjunction with Visit Bend, a local tourism board. "Two things that have become part of the Bend lifestyle are beer and dogs," says Doug LaPlaca, the organization's CEO. "So to create something that would take advantage of the two we thought was a brilliant idea." Dawg Grog isn't the first or only beer for dogs, but that only goes to show that this unusual market can support more than one competitor. If you live in the area and think your furry friend would get a kick out of sharing a cold one with you, you can pick up the beer at Visit Bend's store. Non-locals should check out the Dawg Grog website instead, where a six-pack will set you back $36. That's admittedly a lot more money than picking up a few bottles of Sam Adams or Yeungling, but your dog can probably talk you into it. We both know how well he or she pulls off the "sad puppy eyes" trick.